The Boca Grande Health Clinic had an exciting two days last week, as their annual fundraising festivities began with a quarterly meeting on Thursday, April 7 (see page 20 for that story) and ended with the Hank Wright Golf Tournament on Friday, April 8. A new and exciting event was added to the agenda this year – the ball drop. It took place on the 7th Street Dog Park at 5:30 Thursday evening, with 1,000 golf balls dropped from a helicopter by pilot Steven Busch and Rusty Hager. The winners included Roby Harrington, Melanie Sullivan and Linda Coerver, and they split the winnings three ways. One of the most eagerly-awaited events on the island is the Hank Wright Auction, which was held this year at the Gasparilla Inn Beach Club. Items up for bid included a Kentucky Derby party, a lobster bake, a trip to Ireland, a vintage zebra rug, handmade Christmas ornaments by Barbara Bush and a party for 60 with Brit Hume. That item was sold for $40,000. In all, approximately $350,000 was raised from both days of activities. 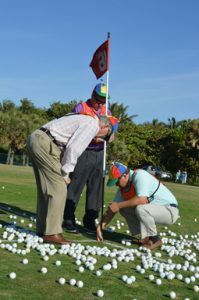 In all, 25 teams participated in the golf tournament, which was held at Lemon Bay Golf Course. Winners included the low gross team of Tom Burcham, Jim Martin, Larry Blau, Daly Walker, Mikey Davey and Leslie Banks, and the first low net team of Jim Grant, Lynda Grant, Jeff Lehrian, Lyndy Hustedt and Brett Hendricks.